Today was one of those days when I had no idea what to cook for dinner till an hour before dinner. I'm sure a lot of you experience this. I opened the fridge half hoping to find a box of yummy Chinese food miraculously appearing out of nowehere but that wasn't to be. Instead I saw a cauliflower looking straight into my eyes, as if to remind me that it needs to be given attention to too. 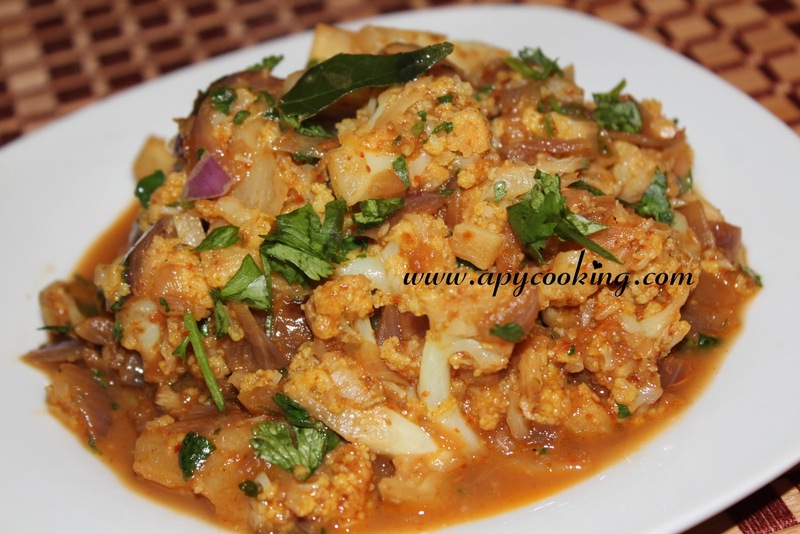 I first thought of doing the usually upkari with it, then thought of trying out gobi gheeroast but was sure hubby and kiddo would find it too spicy. 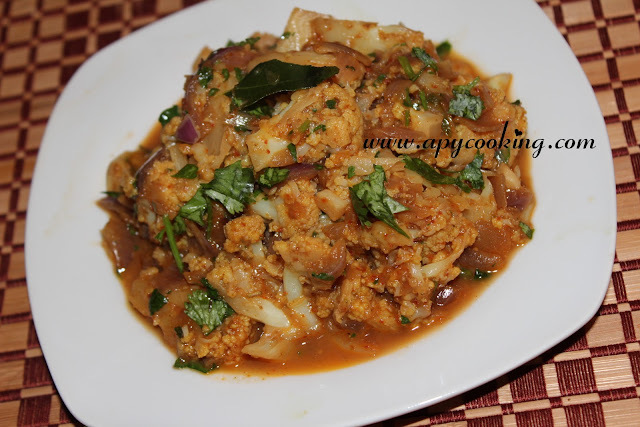 So I cut down the chillies, added some onions, garlic etc and made this simple gobi masala. It was already time for dinner by the time I finished, so I had less than a minute to click some decent pictures. I'm so not excited about clicking pictures of food at night. So these pics were taken half heartedly, with just a few seconds of work on it. Hopefully I'll be able to replace them with better pictures some day. Heat 1 tsp oil and roast jeera, coriander seeds and red chillies. Switch the gas off, add 2 to 3 curry leaves and haldi powder and mix. Allow to cool. Grind with tamarind and about 1/2 cup water to get a smooth paste. Add more water if needed. Sprinkle about 1/2 cup water on the cauliflower florets and microwave for 3 minutes (mix once in between). Drain all the water. In a large pan, heat oil + ghee. Sauté onions, garlic and ginger till onions turn brownish. Add green chillies and remaining curry leaves and roast. To this add the cauliflower florets and roast for a minute. Add the ground paste and salt to taste and mix well. Drizzle tomato ketchup and mix. Add more ketchup if the dish turns out too spicy. Cook for a couple of minutes. [Do not overcook, or else the cauliflower will lose it's crunchiness]. Garnish with coriander leaves. Serve with chapati and curds. 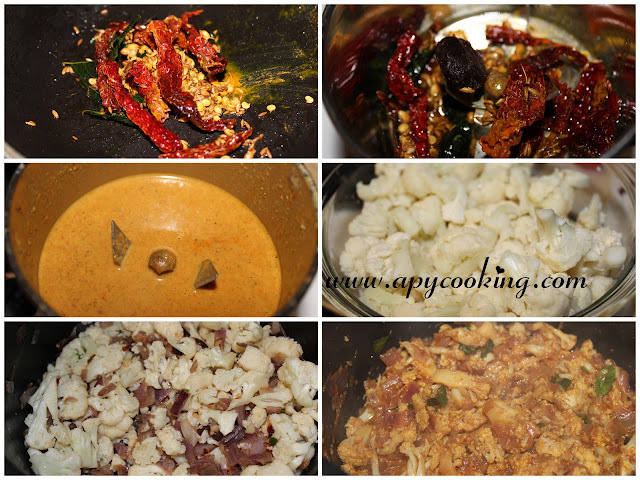 Yummy side dish for rotis..loving it.